Advancement in microphones, automated speech recognition technology, and natural language processing (NLP) help the smart speaker to identify and process the voice command of the user with utmost precision. Amazon offers Amazon Echo powered by virtual assistant known as Alexa and Google provides Google Home powered by virtual Google assistant. These products lead the smart speaker market in terms of value and volume. The other players operating in the market include Apple, Alibaba, Sonos, and others. Increase in demand for smart home devices is the significant factor that drives the growth of the smart speakers market. Other factors, which influence the market growth are increase in consumer readiness to invest on trending technologies and rise in usage of smart devices among the younger generation. Also, the development of partnerships between smart home manufacturers and creators of smart speakers enables smooth integration of smart home devices with the smart speaker. This proves to be a key factor in the adoption of smart speakers. However, with the use of smart speaker, privacy of users’ data becomes a major issue for the consumer demand. Smart speaker provides personalized service to its users by collection and analysis of the users’ data. The potential of exploitation of user’s private data by the manufacturers and the threat of illicit cyber-attacks to invade privacy restrict the demand for the smart speakers from the consumers. Also, complexity in training the virtual assistants with various languages spoken around the world limits the global reach of smart speakers. The key players operating in the smart speaker market include Amazon.com, Inc., Apple, Inc., Alibaba Group, Alphabet Inc. (Google Inc.), Sonos, Inc., Bose Corporation, Xiaomi, Samsung Electronics Co. Ltd., Baidu Inc., and Plantronics, Inc. (Altec Lansing/AL Infinity, LLC). Among the companies, Amazon.com, Inc. captured the highest smart speaker market size. The report segments the smart speaker market based on type of intelligent virtual assistant, end user, price, distribution channel, and region. According to intelligent virtual assistant, it is divided into Amazon Alexa, Siri, Cortana, Google Assistant, AliGenie, Xiaomi Al assistant, and others (DuerOS, SKT NUGU, Naver Clova, and Kakao i). By end user, the market is bifurcated into personal and commercial. Based on price, the market is classified into low (0$ to 100$), mid (101$ to 200$), and premium (above 200$). Based on intelligent virtual assistant, Alexa captured the highest smart speaker market share in 2017. Based on distribution channel, the smart speaker market is categorized into online and offline. Based on region, it is analyzed across North America, Europe, Asia-Pacific, and LAMEA. 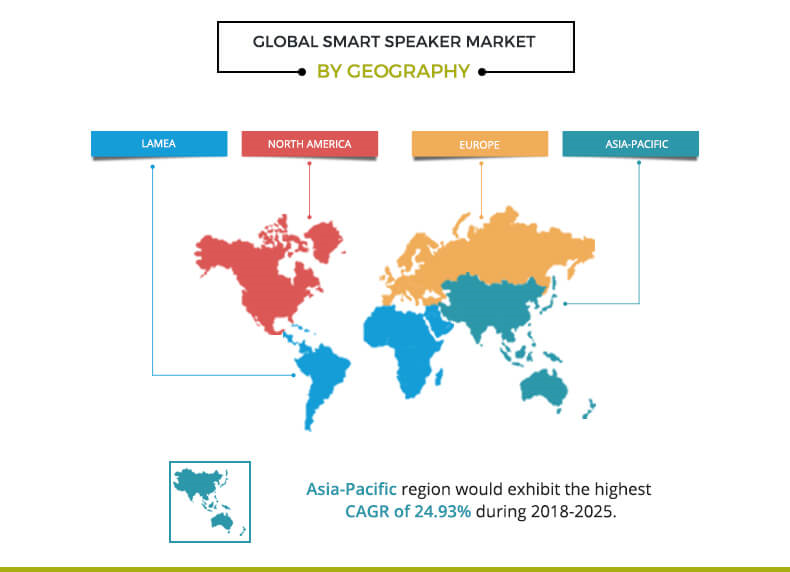 Proliferation of smart home devices, increase in demand for multifunctional devices, rise in disposable income, and inclination toward technological products among younger generation are the factors that drive the growth of the global smart speaker market. However, privacy and security concern and localization of language spoken by intelligent virtual assistant restrain the market growth. Moreover, establishment of wireless 5G infrastructure and advancement in NLP are expected to create tremendous opportunities for the market growth. Increase in usage of smart home devices drives the sale of smart speakers in the market. As the global market is currently undergoing its transition from the information age to the era of artificial intelligence, it results in many technological disruptions and innovations enabled by the power of artificial intelligence. Therefore, traditional consumer home devices, which were operated manually, are gradually being replaced by smart devices. The ability of the smart speakers to smoothly integrate with the smart home devices significantly boosts the growth of the smart speaker market. Multifunctional devices enable the users to do multiple tasks using a single device. There is an increase in the adoption of these devices, as they offer different utility options. For instance, the smartphone market experienced significant growth in recent years because it offered different features in addition to basic communication. Similarly, the features such as listening to music, ordering food, booking tickets, obtaining factual and other types of information, and controlling smart devices and various other things through a simple voice command offer more utility to the consumer at minimal incremental cost as compared to other substitute products, such as wearable devices. As a result, there is an increase in the adoption of smart speakers among the consumers. The purchasing power of the consumers has increased due to rise in global disposable income. For instance, according to OECD research, the annual household disposable income in the U.S. increased by 1.5% in 2016. This also makes way for the tech-savvy consumers to purchase more number of technological gadgets, such as smart phones, smart home devices, and smart speakers. Moreover, there is an increase in awareness among the consumers through social media feeds, television, and recommendations by friends or through other platforms. Further, due to fast-paced lifestyle, there is need for smart gadgets among the consumers. These developments boost the growth of the smart speaker market. The potential of smart speaker manufacturers to misuse the private data collected by the smart speaker poses a threat to the privacy of the data. Smart speakers are activated when they hear the wake word. For instance Alexa in case of Amazon Echo smart speakers or Ok Google in case of google home smart speaker. Then the queries sent to the server are processed and stored in digital logs for further analyzing voice patterns; although users have the option to delete the data later. Other speakers in the smart speaker market have similar methodology to be activated. Thus, there is a fear in the minds of the consumers regarding manufacturers having the potential to exploit their private data for targeted advertising or other uses. This is one of the factors, which limits the market growth from the consumer side. The major challenge especially for emerging players in the smart speaker market is the challenge of localization. According to Ethnologue, there are 7,097 living languages in the world. Localization of smart speaker means the integration of intelligent voice assistants with relevant local language, accent, entertainment, information, and other services. Internationalization of smart speakers has multiple challenges. These include (a) language understanding and translation, (b) speech recognition for the languages, including dialects and variations in accent, (c) addition of local knowledge or culture to the system (local music, local retail markets, news, celebrities, and jokes), and (d) spoken language generation. The huge dependency on digital infrastructure drives the R&D of high speed internet. 5G, the fifth generation wireless mobile standard. This dependency is expected to be deployed till 2020 across various developed and developing nations. This wireless standard is expected to offer explosive data transfer speed up to 10 Gbps. This infrastructure is expected to support the rise in penetration of Internet of Things and smart devices, which require high data transfer speed for efficient performance. Smart speakers are devices, which require the use of high speed internet for transfer of the queries to the server and its processing to provide a response. The delivery of quick and efficient response by the smart speakers is possible with high speed internet. As a result, the deployment of high speed 5G infrastructure is expected to propel the growth of smart speakers and other smart devices. NLP is a branch of artificial intelligence that enables computer to understand, interpret, and manipulate human language. It also helps smart speakers to communicate with human beings. Thus, NLP is the technology underpinning the revolution in the development of human computer relations. The increase in investments in the R&D of NLP and artificial intelligence is expected to improve smart speakers and other smart devices. The interaction between smart speaker and consumers is expected to be more interactive and informative due to continuous enhancement of NLP. 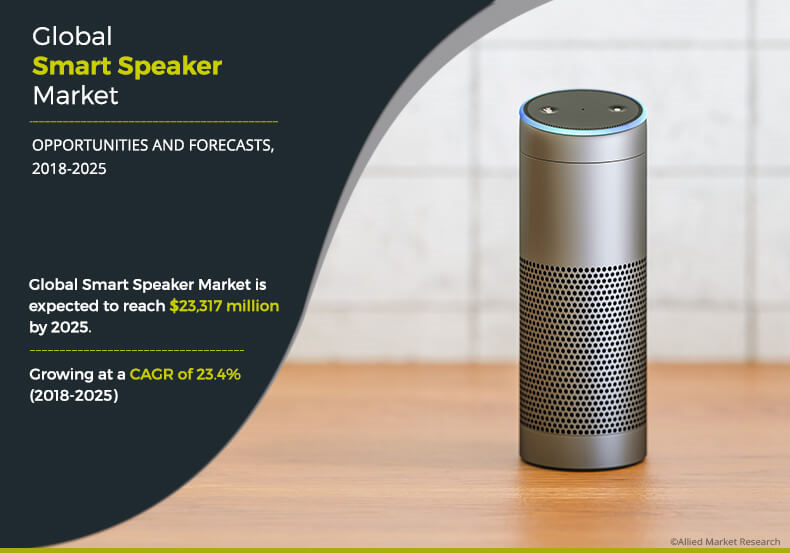 This study comprises of the analytical depiction of the global smart speaker market analysis along with current trends and future estimations to depict the imminent investment pockets. The overall smart speaker market potential is determined to understand the profitable trends to gain a stronger foothold. 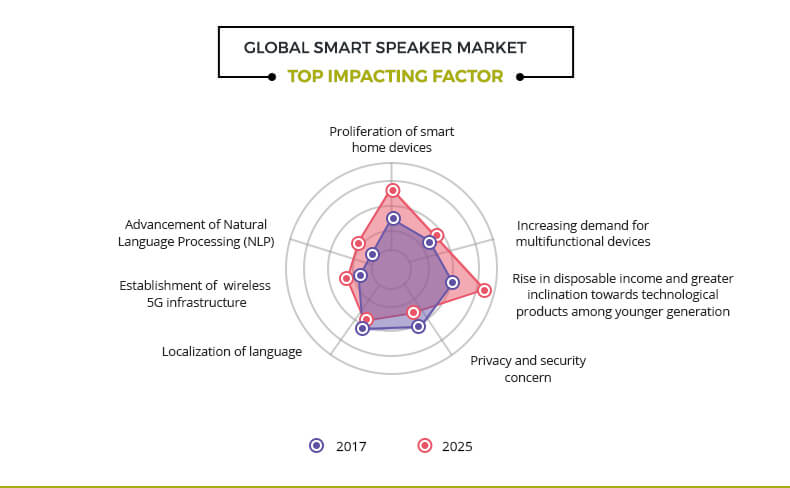 The report presents information related to key drivers, restraints, and opportunities of smart speaker industry with a detailed impact analysis. The current smart speaker market is quantitatively analyzed from 2017 to 2025 to benchmark the financial competency. Porter’s Five Forces analysis illustrates the potency of the buyers and suppliers in the smart speaker industry. 3.5.1.1. Proliferation of smart home devices. 3.5.1.2. Increasing demand for multifunctional devices. 9.2. Samsung Electronics Co. Ltd.
Smart speaker is a wireless speaker enabled by Bluetooth, Wi-Fi, or other wireless protocols and powered by virtual assistant, which is driven by artificial intelligence. It is the latest technological innovation dominating the consumer technology market. Smart Speakers are activated through a voice command and can perform different tasks such as listening to music, ordering food, and online shopping. They also perform other activities, such as obtaining weather information, latest news, listing day to day activities, and easier integration with the smart home appliances. These multiple features provide an edge to smart speakers over other substitute technological products and services. Proliferation of smart home devices, increase in demand for multifunctional devices, rise in disposable income, and inclination toward technological products among younger generation are the factors that drive the growth of the market. However, privacy and security concern and localization of language spoken by intelligent virtual assistant restrain the market growth. Moreover, establishment of wireless 5G infrastructure and advancement in natural language processing (NLP) are expected to create growth opportunities for the market. Among the analyzed geographical regions, North America is expected to account for the highest revenue in the global market throughout the forecast period (2018-2025) followed by Europe, Asia-Pacific, and LAMEA. However, Asia-Pacific is expected to develop at a higher growth rate, predicting a lucrative market for smart speakers.